Spates “Bud” L. Roblyer was born in June of the year 1938 in Cumberland, Maryland. During those years he met his wife Waltraut “Val”, they were married for 61 happy years. 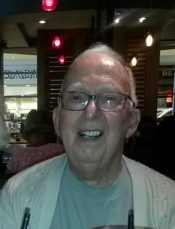 “Bud” was involved in many organizations though out his life, he was a dedicated Stephen minister and also a lay minister in the Gonzalez United Methodist Church. He was a Mason and member of the Rotary club. He also served honorably and faithfully in the US Navy for 20 years. He is preceded in death by his father and mother Servatius and Catherine Roblyer, as well as a precious baby daughter Margret D. Roblyer. He is survived by his Sons; Karl “Kelly” Roblyer (Joann), Bud “Buddy” Roblyer (Colleen), Michael ”Mike” Roblyer . His Daughters; Suzanne “Susie” Ashmore (George), Ramona “Mona” Tolbert (Maurice), Brother; Michael R. Roblyer Sisters; Margaret D. Roblyer, Rebecca R. Kelly, along with 13 grandchildren and 11 Great-Great grandchildren. The Family would like to give special thanks to all the doctors and staff of the Baptist Hospital and Covenant Hospice Care, the Members of the Gonzalez Methodist church, Riley Richardson and Bob Handler, also dear neighbors and friends. A Visitation will be held at Gonzalez Methodist Church on April 11 at 12pm with a service to follow at 1pm. Bud was such a good man! His humor, kindness, and love for others made him so much fun to be around. He was a Godly man who loved life. He will be greatly missed! So sorry to hear about the loss of Bud, what a great man! I remember all the laughs I had in the Roblyer house. His kindness and generosity will live on in many memories.